Happy Friday ETH Friends! I think some of you were sending your sweet little ones to school this week so I hope and pray that send off went well! As you may have heard, my sweet parents Dennis and Barbara, announced last week that David and Meg Robbins will be taking over the leadership of FamilyLife in December. This transition has been in the works for 2+ years and I am excited about David and Meg as I spent more time with them last week but to be honest, I have also felt some sadness as I am anticipating an incredible end to what has been a beautifully long chapter for my parents. My parents have faithfully served the people and ministry of FamilyLife for over 41 years. This kind of commitment is almost unheard of today (who stays in one role for over 40 years? amazing.) and they have sacrificed MUCH over all of those years. They’ve said no to a lot of things, fought for their marriage, for our family, and have always sought the Lord through every decision they’ve made. They are what they preach and what you see is who they are at home, when no one is watching. Their faith and walk with the Lord has deepened through many struggles, joys, trials and unknowns as they practiced full dependence and trust in the Lord. I could write a book about my parents and all that they’ve done but since I am getting teary thinking about how grateful I am for them, and last week started the beginning of “the end” for them at FamilyLife, I’ve decided to call an audible on the last question of the week. This isn’t one that you would find in the Untie Your Story Questions tin, but is one that I would love for people to answer as a small “thank you” for my parents. 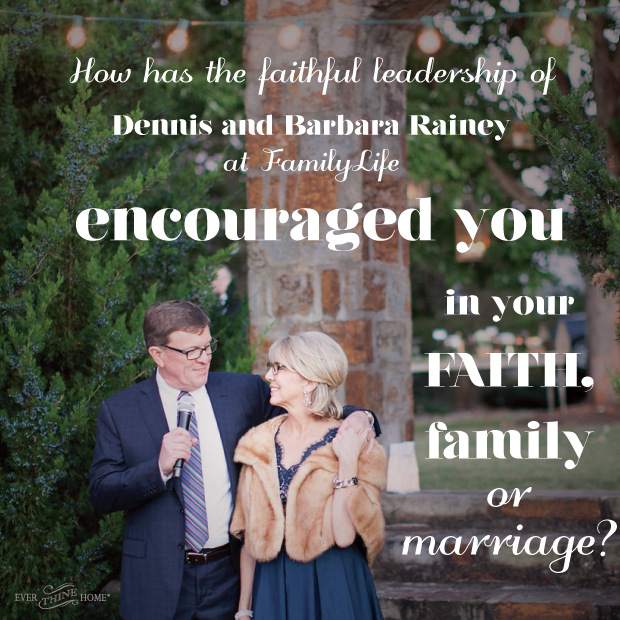 SO, the question is: How has the faithful leadership of Dennis & Barbara Rainey at FamilyLife encouraged you in your faith, family or marriage? I can’t wait to read your responses. 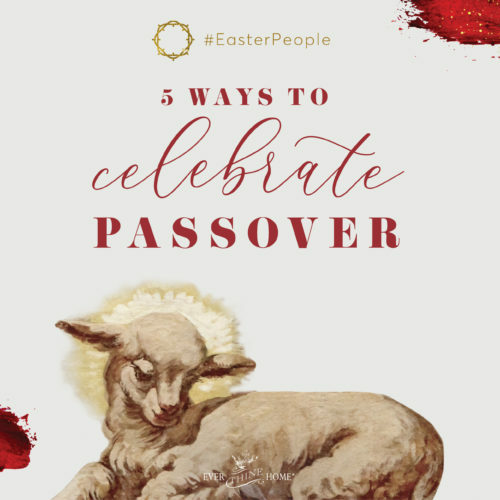 My heart was so proud reading some comments from Facebook last week so if you know someone who has been encouraged through FamilyLife and they don’t follow our blog, please encourage them to pop over here and share with us! I would love for these responses to pour in and send them to my parents to read over the next several weeks and months. I haven’t been on this blog for too long but your stories, teachings ang life lessons have made a great impact on how I live as a wife and mother. I discipline myself to apply most of the things I read and I see the changes in me and my entire family. Thank you for being a blessing to me and other countless people, even without physically meeting us. God bless you both abundantly and increase you in wisdom for the task He has set apart for you in the future. Wow! Your retirement will be a tremendous loss, yet we know you will have selected and trained your replacements well~what a blessing that will be for everyone. I’ll read all your blogs. Your story influences my life, even though I’m not married. I would like to learn how to face the challenges in life in the future. Getting ready to celebrate 14 years of marriage on August 30. Our first experience with family life today was attending a marriage conference when we were engaged. It was a great addition to the premarital counseling we were already doing. We have also benefitted from your devotionals and date night publications. We are so grateful for you and your ministry. Well done good and faithful servants!! I have been listening to Familylife Today for many years and have treasured the information that I have gotten. I have laughed and cried with Dennis and Bob. Our family has enjoyed reading Barbara’s books – especially the one about the Thanksgiving story. Thankful also for the Company French Toast – we make it every Thanksgiving for breakfast! My husband and I just found out about your ministry earlier this year when we attended one of your marriage conferences. We have had counseling from two of our 4 pastors on staff and a counselor on our church staff, and none of them were able to help us like you have. May God bless your retirement years. We are truly grateful for all that you have done for others and the sacrifice you made for all of us. I am a military wife and had lots of challenges with my marriage and raising my children almost as a single mother. I have learned so much from the Rainey!!! They show love for each other, and love for others that show to all of us. My husband and I went to Weekend to remember that was life changing. Now oour son is engaged and we are passing this on to the next generation. What I truly love about Barbara is that she always shows respect for women and I feel like through her words women see that they deserve respect. It is so important. Christian women need to hear that. Thank you so very much for your leadership, your dedication and to the love that you share to so many. May God bless you in a that you do. I always considered them experts in marriage, parenting, and family life. My thoughts were: “if Dennis and Barbara Rainey said it, then it must be bible-based, true, and sound.” I appreciate their leadership, their writings, and giving their lives to the important work of fostering the family. What will we do without you? The legacy will live on, I am sure, through your children and those who have been mentored by you. Thank you from the bottom of this momma/grammy’s heart…. Thank you Dennis and Barbara for your dedication and trust in the Lord as you have traveled this journey. I have attended Family Life weekends and have made it a priority to give this gift to each of my four sons & wives as they were married. May God continue to bless you and your families. Dear Dennis and Barbara, you have been with us in support as we raised two children who are now young adults who love the Lord and are serving others. You especially helped us when they were teenagers. I listens to the radio program and have used many of your resources. My husband and I have attended the Weekend to Remember Conference and have encouraged others to do so. Thank you so much!!! You’ve made and eternal difference in our family. Thank you Barbara and Dennis for your faithful dedication to Family Life. We attended our first conference 30 years ago and it changed the trajectory of our new marriage as we learned the purpose of marriage and the importance of the legacy we will leave behind. We also attended the Parenting conference twice and i am thrilled to hear you will be launching the Art of Parenting this year. Because we are so committed to the institution of marriage and doing things God’s way, we have been mentoring engaged couples and helping to enrich couples that are asking for help. We also encourage these couples and friends to attend the Weekend to Remember. It is exciting to see God change marriages and families through your ministry. I love listening to FL Today and I have learned many tips for relationships.Thank you for Fighting the Battle for marriage and family for 50 years. Many blessings as you step away from the captain’s seat! Thank you seems inadequate, but we are eternally grateful for your ministry. From the first time we attended the premarriage conference on the Queen Mary, to our time as City Ministry directors, we use the principles that we learned to this time of our lives. The big one…..you are not my enemy and we have hung onto that principle all these years. We have learned much, tried to encourage others and raised a Godly family with much help from Family Life. Well done! We are privilege to know you! Wishing you God’s blessings in the next chapter of your lives. Hallo, iam writing all the way from Kenya. I have really benefited from the articles from your parents. I have grown in faith, marriage, family and parenting life. May the lord greatly bless them for their service . Amen. Iam Rose. Though I am now divorced after a 23 year relationship your stories give hope. How I wish they would have prevailed in my relationship that was. It to be. Your priorities are on point , your balance is an inspiration. I wish more people would listen and more men would be leaders in a godly manner. We are a blended family of 30 years who have been profiting from the Family Life Ministry throughout those years. We have listened faithfully to Family Life Today! We have attended the Weekend to Remember conference, sent out adult children and bought many Family Life books! Thank you for Family Life/ Blended! We facilitate that ministry in our church. God bless you, Barbara and Dennis, in this wonderful new season! We love you! Equipped. That’s what I feel Family Life has done for me. My kids are now 25 and 22. We did Passport weekends with each of them. My husband gathered a few other dads to work with a group of teen boys on raising modern day knights. 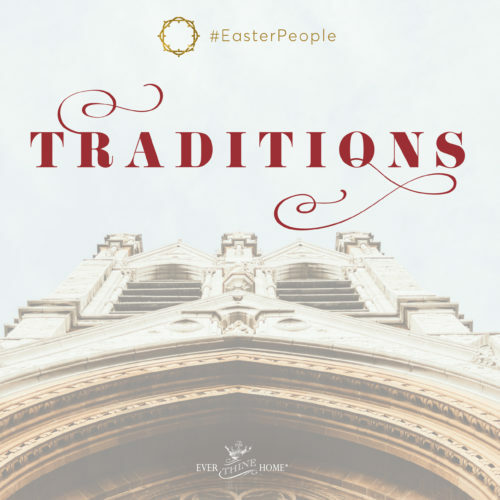 As a stay-at-home mom I faithfully listened to the radio broadcasts learning much from the discussions and pointed to challenging Christian resources. I appreciate very much how Dennis and Barbara have led the charge in standing strong for biblical marriage and family. I have been equipped. Now I’m thankful for the ETH ministry being challenged and encouraged by Barbara (and friends). Thank you, thank you for your perseverance and dedication and always pointing us to the Lord. Many blessings on a new chapter for you. First, I hope your mother will continue to develop her home products for Ever Thine Home. The Christmas Ornaments I bought last year so enhanced my tree and gave a message to my non-Christian sister and brother-in-law when they came over. I sincerely hope these products continue (or that you continue, in your mother’s stead) because they are a form of witnessing. Second, I discovered your father’s radio show, Family Life Today, while driving to work. I got so much from listening to him and his guests. I wish he would continue the show! One thing that really surprised me was his absolute rejection of divorce for any reason, even physical abuse. Of course, he recommended a legal separation, with counseling for the abuser, but he did not even see this as a reason to end a marriage. This got me thinking about my own wedding vows, as I was recently married for the third time. It helped me know that I want the kind of marriage your father stood for. I am now with my husband until he dies (or I die first). This is a whole new way of thinking about marriage, and I am very grateful for your father’s stand about this. Please thank him for me. My husband and I attended Weekend to Remember several years ago. For the last couple years I’ve been enjoying Barbara’s blogs. 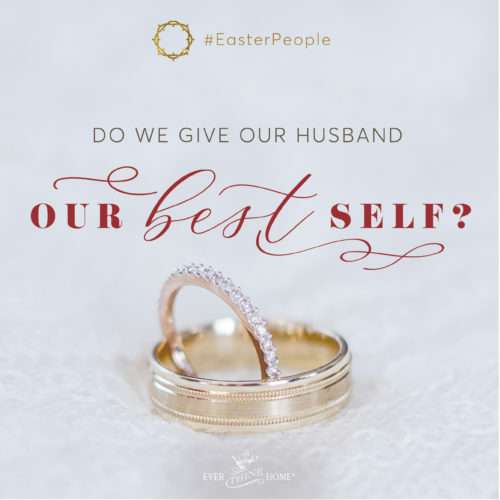 Whenever I get to feeling overconfident in my marriage relationship, she gives me a kick to get back on my toes and be the wife God wants me to be. My husband and I have been blessed many times over the past twenty years by the Family Life Ministry. The book, Preparing Today’s Adolescent, has been read and pored over as we raised our three kids, now 23, 20, 17. We have recommended the book and given it out several times. The godly wisdom and honesty was wonderful! In addition, we had the privilege of attending a Weekend to Remember conference, which strengthened our commitment to each other. We are married over 25 years, happily. The Family Life Radio program has offered many thought-provoking programs that we as a family have listened to in the car traveling to and fro. You have been a blessing to our family. Thank you. Thank you for your ministry and for living out the gospel of Jesus Christ in your lives. My daughter and I have been through passport2purity and passport to Identity and she’s grown so much and we’ve grown closer through these special weekends. From listening to her on the CDs my 14 year old and I feel like we know Barbara personally and love her dearly! My husband and I have enjoyed weekend to remember so much that we brought my brother and his new wife and it really helped them start on a solid foundation. We bought a weekend for my sister and her husband and they should be attending soon as newlyweds! Your work is so invaluable, Dennis and Barbara. Thank you so much for your faithfulness. Though I’ve never married and am childless, frequently I’ve listened or read your material and have been encouraged in my walk w/ the Lord. I’ve tried to share with others the wisdom gleaned. Thanks for your logical/common sense(illogical and uncommon in the eyes of the world) responses to the challenges so many of us face. God bless you as you readjust your focus and begin the challenging ‘stepping back’ from your roles in this mission. You have both been an inspiration to my husband & I. We first experienced Family Life on the first LLYMC. Where we saw first hand the love of Christ in you & for each other. As well as the body of Christ. Thank you for serving the Lord through the ministry. Our prayer for you both is that you will still continue to see His hand through every path you take. Thank you so much for your faithfulness in serving the Lord. I have enjoyed listening to you each day and your emails. Thanks for helping me along the journey in life. Thanks for speaking the truth. May God continue to bless you in all that you do. I joined Family Life as our family has been walking through a very difficult struggle. They have pointed me in the direction of Christ at every turn. I love the Lord and I knew the answers are in Him; they have just guided the way to His heart so many times. God bless them both. ← What Keeps You From Going to God?